The place where history is made. 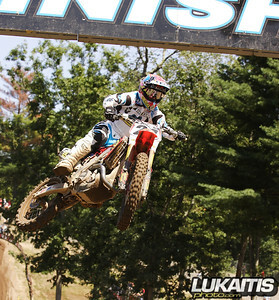 Rockstar/Makita/Suzuki’s Ryan Dungey put his name in the record books this past weekend with his 1-1 moto finishes at the Southwick Massachusetts round of the Lucas Oils AMA Motocross Championship. In his rookie season, Dungey has not only his Supercross Championship but now the Outdoor Championship as well. This was the first time in the sport’s history that a rider has won both championships in his rookie season. 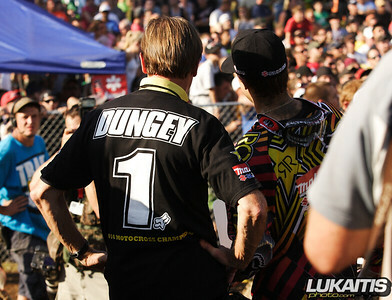 Decoster and Dungey celebrate the championship. Geico Powersports/Honda’s Brett Metcalfe grabbed the holeshot of moto #1 with Troy Lee Designs/Honda’s Ben Townley and Rockstar/Makita/Suzuki’s Ryan Dungey close on his heels. 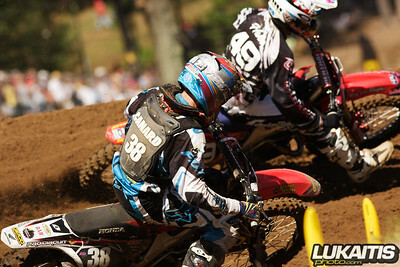 Metcalfe began to check out on the pack and when Townley went down Dungey settled into the #2 spot. Rockstar/Suzuki’s Tommy Hahn settled in for third and the three riders began to distance themselves from the rest of the field. Metcalfe was leading with Dungey close on his heels ready to pounce should Metcalfe mis-step. Disaster struck Metcalfe with less than 1/2 lap left. 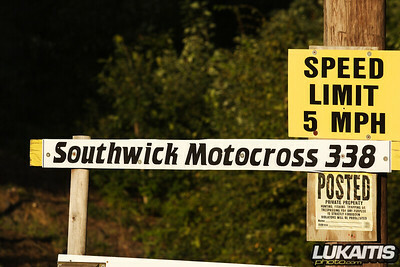 The tough Southwick tracks sandy surface robbed Metcalfe of all his fuel and his tank ran dry less than 5 turns from the end. Dungey went past to take the win followed by Hahn in second and Jagermeister/KTM’s Mike Alessi in third. Brett Metcalfe led all but the last 1/4 lap. Townley grabbed the holeshot of moto #2 followed closely by Dungey and Red Bull/Honda’s Kevin Windam. 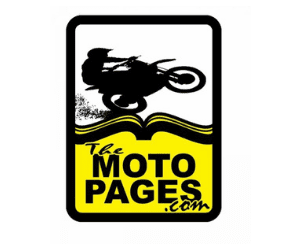 Townley set off looking for the elusive moto win with Dungey close on the rear fender of the Honda pilot. About halfway into the moto Dungey made his move and made his way around Townley. The new champion went on uncontested the rest of the way for the victory. Townley was second in the moto but his 34th place finish in moto #1 left him off the overall podium. Last years overall winner Matt Goerke charged all afternoon in his first race back after injury and was rewarded for his hard ride with third overall for the day. 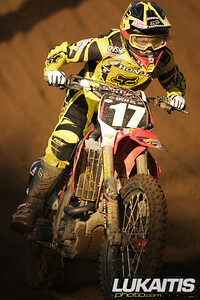 Mike Alessi was second overall. 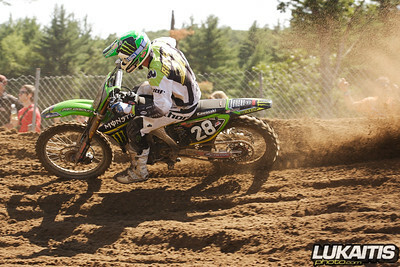 Consistency gave Tyla Rattray the overall in the 250 class. By virtue of 2-2 moto finishes Rattray stood on the top step of the podium ahead of championship frontrunners Trey Canard in second and Christophe Pourcel in third. Tyla Rattray became a new father on Saturday morning and then went on to win the overall. Troy Lee Designs/Honda’s Wil Hahn grabbed the holeshot with Geico Powersports/Honda’s Trey Canard and DNA Shred Stix/Star Racing/Yamaha’s Nico Izzi hot on his heels. Monster Energy/Pro Circuit/Kawasaki’s Tyla Rattray was working his way up through the pack and eventually displaced Izzi for the #3 spot. Meanwhile out front Canard closed on Hahn and found a way around the Honda rider and set off to widen his gap on the field. A couple of laps later Hahn would give up the #2 spot to the charging Rattray who despite his best efforts ran out of time and couldn’t find his way past Canard. Canard would take the win with Rattray and Hahn rounding out the top 3. 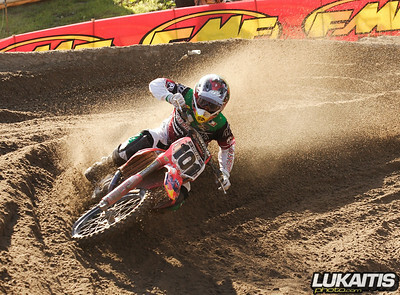 Trey Canard sets Wil Hahn up for the pass. Hahn again grabbed the holeshot but last years winner Geico Powersports/Honda’s Justin Barcia was quickly around him into the lead. 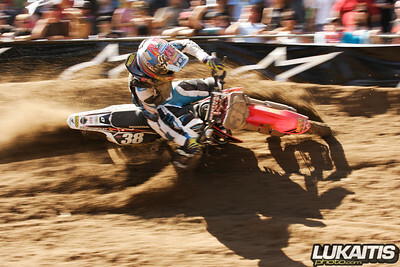 Barcia put on a sand riding clinic and checked out on the field. Hahn was also displaced early by the Monster Energy/Pro Circuit teammates Christophe Pourcel and Rattray in second and third respectively. Rattray would get around Pourcel and start to close the gap on Barcia but there was not enough time for him to make the pass and at the moto’s end it was Barcia, Rattray and Pourcel 1-2-3. 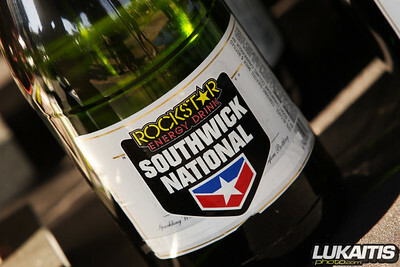 Rattray took the overall win followed by Barcia in second and first moto winner Canard in third. 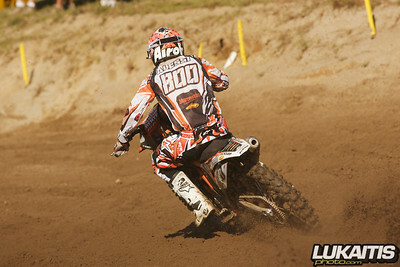 Trey Canard was third overall for the day. 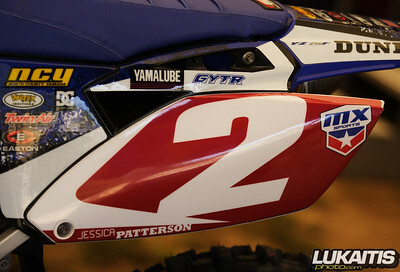 Jessica Patterson continued her winning ways by taking home the overall with 2-1 moto scores. 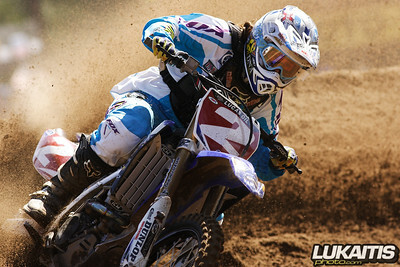 Defending Champion Ashley Fiolek finished second with a 1-2 moto tally. Jessica Patterson is hoping to lower this number by the end of the season. Red Bull Honda Racing’s Ashley Fiolek rocketed into the first turn with the holeshot ahead of a yard sale crash that took out a good portion of the field including DNA Shred Stix/Star Racing/Yamaha’s Jessica Patterson. Fiolek started to gap the field while Troy Lee Designs/Honda’s Tarah Geiger held onto second and Monster Energy Kawasaki’s Sarah Price sat in third. Patterson put on a charge through the pack and as the moto drew to a close she began to close on her rival Fiolek. Despite her best efforts, Patterson ran out of time and Fiolek took the win with Patterson in second and Geiger in third. 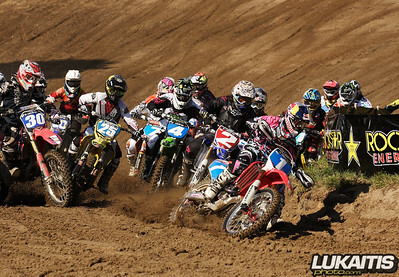 Ashley Fiolek grabs the first moto holeshot while carnage ensues behind her. Fiolek again jumped out to the early lead but Patterson got around her early on the first lap. Patterson then said goodbye to the field and went on for the moto win. Fiolek settled into second and Geiger rounded out the top 3. The same was true for the overall with Patterson, Fiolek and Geiger 1-2-3.